Crystal River doesn’t have a major airport. We rented a car in Orlando and reached Crystal River in about 2 hours. Crystal River is on the west coast of Florida. 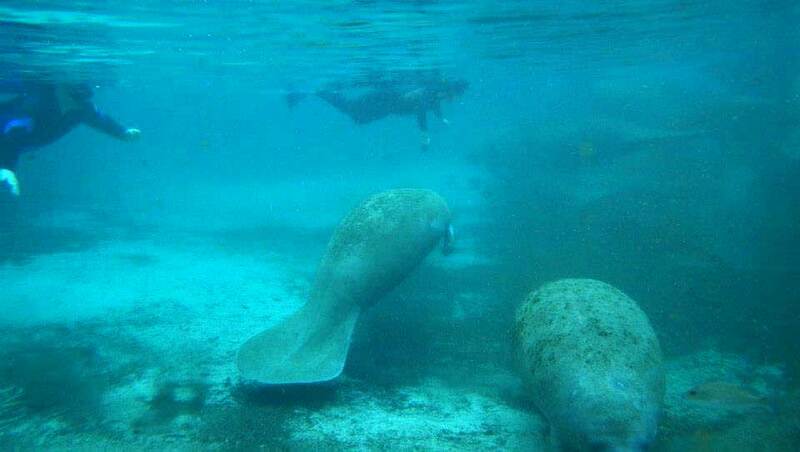 You can also get to Crystal River on a day tour from Orlando for your manatee snorkel. 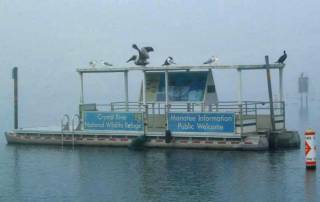 Crystal River is known as the “home of the manatee”. 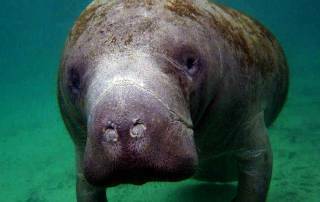 Florida manatees can’t survive Gulf Coast temperatures that dip below 68 F (20 C) in winter. About 70 natural springs flow into King’s Bay near where the Crystal River meets the Gulf Coast. More than 400 Florida manatees enjoy the constant 72 F (22 C) temperaturesby by heading up the Crystal River to King’s Bay during the winter. 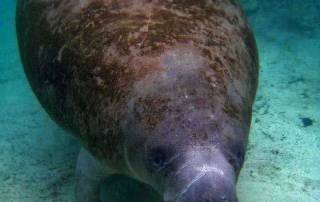 The number of manatees in the bay has been increasing recently, which makes it easy to have a successful manatee snorkel. 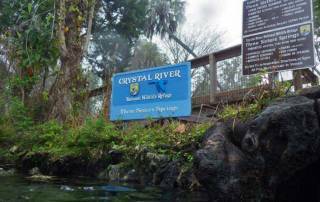 Crystal River has become a major tourist destination since 1983 when the Crystal River National Wildlife Refuge was established specifically for the protection of the endangered Florida Manatee. 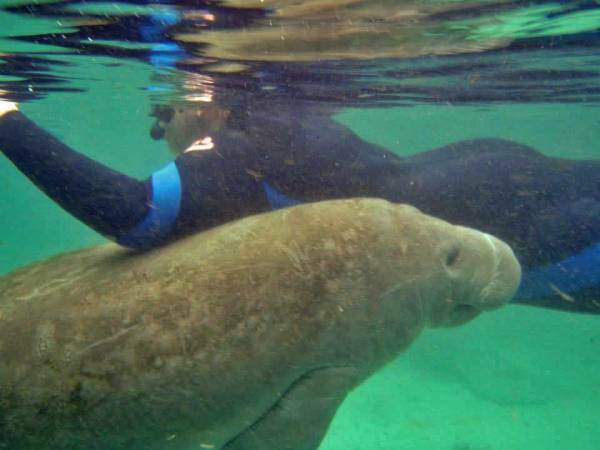 It’s the only place in the United States where it is legal to interact with manatees. 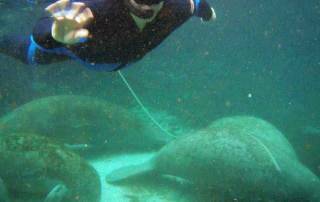 Manatees are friendly and curious enough that they will approach and snuggle with snorkelers. 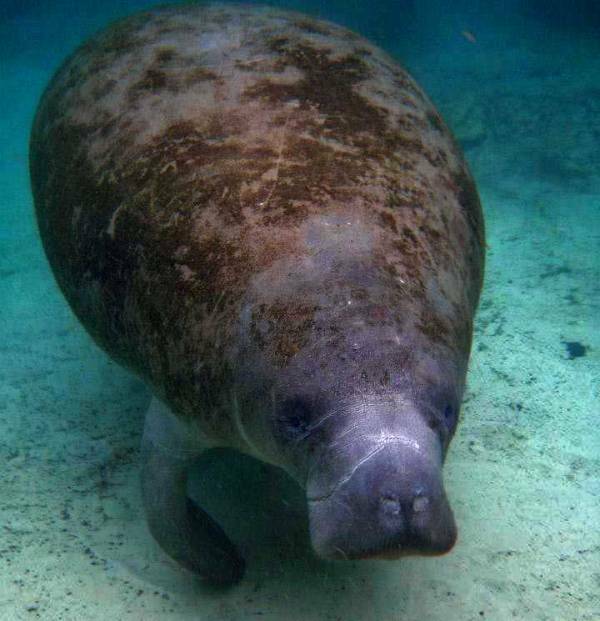 It is illegal to approach a resting manatee, chase or feed a manatee or separate a mother and its young. 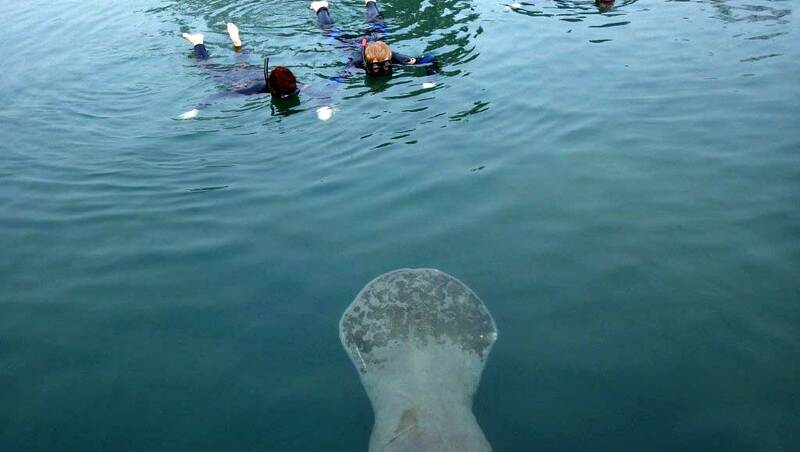 Manatees are mammals. Adults average 10 ft long and weigh 800-1200 pounds. 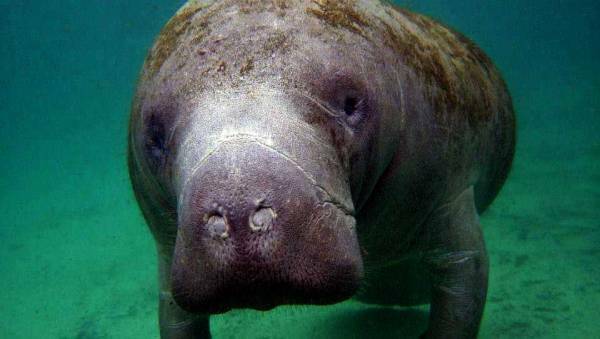 Florida manatees can stay under water about 20 minutes and prefer water about 5 feet deep. 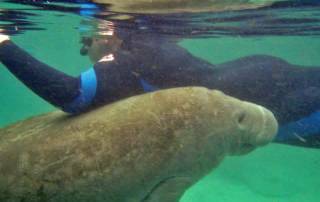 The Crystal River National Wildlife Refuge encourages visitors to make reservations with local dive shops and marinas for the opportunity to swim with the manatees. We chose Manatees in Paradise. 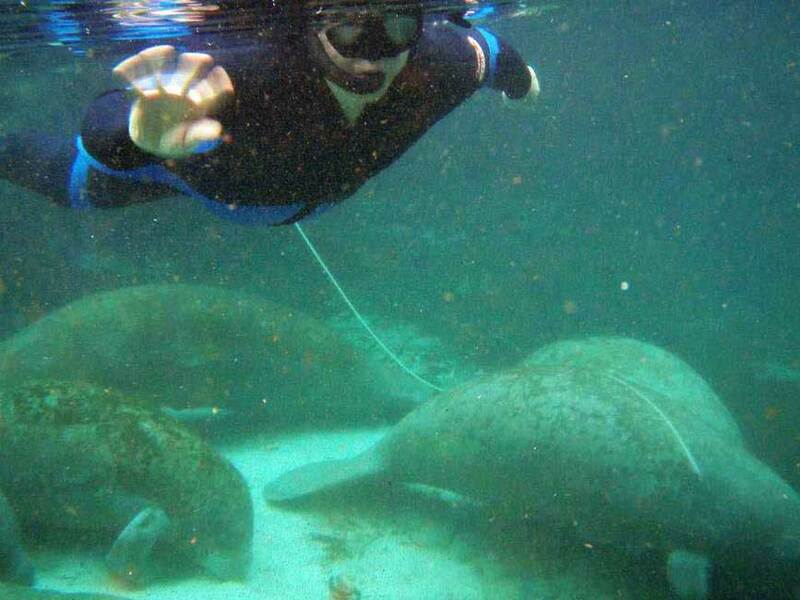 We enjoyed our time with Manatees in Paradise. 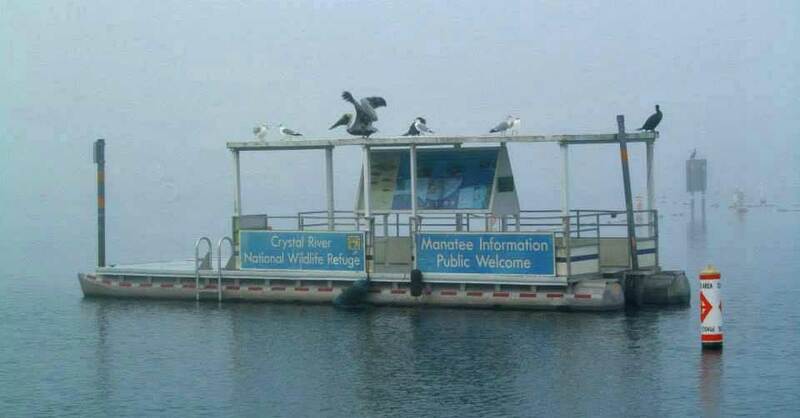 They are located near the Plantation on Crystal River. Fees included wet suits and photos sent to your email address. The maximum group size was 6, which was very nice, especially when some of the other tours had up to 25 people at a time. The 8 am start time allowed us to drive in that morning from Orlando by rental car. 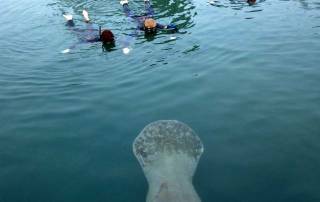 Manatees in Paradise asks snorkelers to lift their hands out of the water when a manatee approaches, so the manatee decides what to do next. They will brush up against you and one even gave my boyfriend a hug. 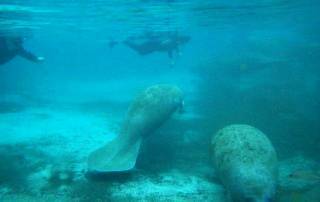 We spent most of our time near the Three Sisters Spring, which was an excellent location for our manatee snorkel. The manatees were remarkable. 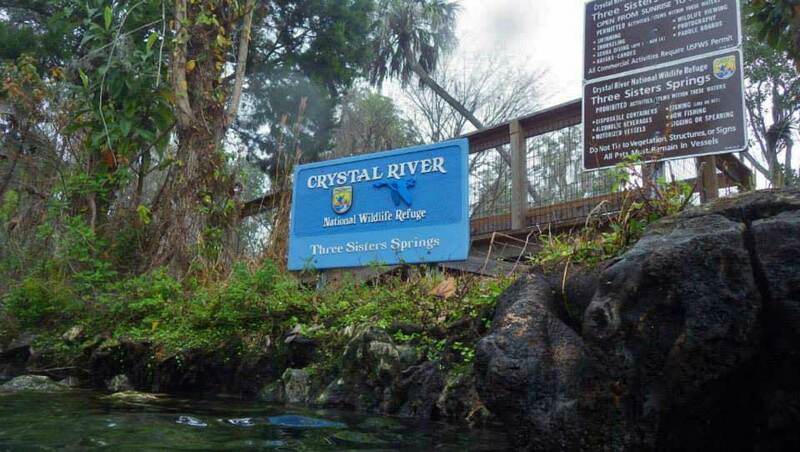 After your snorkel, visit the Crystal River Archaeological State Park. If you want to stay more than the day, try staying at the Plantation on Crystal River.